As iOS device owners, we're big app users here at FS, and always love when something movie-related comes along. Yesterday we featured Paramount's new 100th Anniversary app looking back at their films, now we've got another cool app looking towards what's coming up. This one is called Showreel, and while there's been a fair share of movie trailer apps (including one from Apple themselves), this was made by Riot and it's great. Not only is it designed well, but it works well, it's intuitive and fast and nothing gets in the way, you can watch movie trailers all day and never have to visit the web (hey wait a minute, don't leave us behind!). Thanks to Beautiful Pixels for the tip. The Showreel app currently costs only $0.99 to buy in the iOS App Store, and I believe that's a discounted price so grab it now while you can. "We showcase nothing but the latest & greatest movies every week. Great art and movie details provide the perfect backdrop to the viewing experience. Browse the latest movie trailers right on your iPad, then sit back and enjoy in outstanding High Definition!" You can also stream trailers over the air to your AirPlay-enabled Apple TV (for the best viewing experience). While we've considered making our own trailer app before, I've come across too many apps like this that do a much better job than we could by ourselves, so I'd rather recommended and use these apps. 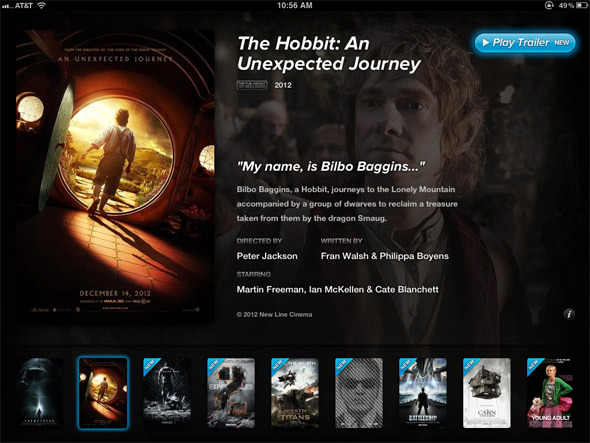 We love all kinds of cool iOS apps like this, so we'll keep featuring any good movie ones that get released. Its clean. I'll definitely have to check this application out. Sounds good but why would I want to pay money to watch free trailers? That's a legit question for any app that costs money... but I think it's that they'd like to make $$ from designing/coding the app, and you're paying for the app not the trailers, but I hear ya. Trailers are free anyway, so why pay? I'd love to check it out, but no way I'm paying for what equate to advertisements. Oh, and iPad only. Thanks Alex! Speaking of apps, will we see a FS app and lose the "Coming Soon!" message? I am working on developing some app ideas... so yes hopefully soon! We're not planning a "FS app", but some cool movie-related ideas. You'll hear about them soon, don't worry! Youtube for me. Thanks anyways. Yawn. Even the iTunes App is way better- and has all the newest trailers (oh and free). This app only has like a dozen trailers from all of last year. Fail.